We should try to nurture all good qualities during this phase. I’m sharing below some simple but interesting intellectual activities to promote cognitive and mental development in kids. A. Organize a family interview: This is a wonderful idea for developing communication skills and confidence. Being a part of such an event takes away the fear of public speaking in kids. Method: Explain to your child that he/she will be the anchor of this event. And they need to prepare some interview questions about any family member (Father or grandfather). I am sure your child and all family members will be excited for such an event. Great fun with great creativity and learning. You may even shoot a video of the interview for more fun. B. Complete the story game: This is another interesting activity to enhance imagination power in kids. It may be done among family members or in group of kids. Method: One person will start a narration of a story, but will stop at one line. Then the second person will continue the second line and so on. In this way with the help of all members, a new and interesting story will form. This activity will explore imagination and thinking process in kids. C. Organize a family seminar: Organizing a family seminar with a specific theme is a wonderful way to develop confidence and stage presence in kids. Method: Select a theme like ‘My Favourite Animal’ or something similar for smaller kids and ‘My Favourite Leader’ or Sport for older kids. Ask your child to prepare a speech on that topic. They may use flashcards to make this activity interesting. During the event, one person will be anchor, other one is the judge. Encourage your child to speak confidently on their subject. Help them if they forgot and reward them for good performance. D. Extempore: It is a classic competition that usually organized in schools and college, so why not try this at home? Method: Put slips of different subjects in a bowl. Ask kids to pick slips one by one and tell them to speak spontaneously on that subject. It is an amazing activity for decision making and thought process. 1. Inexpensive Wall Art: For this you first need to select a theme. We had selected a theme called “WE LOVE” and asked kids what they love and what they like? It is a simple question to start the thinking process in kids as even preschoolers can answer that. Like all other kids they answered we love chocolate, ice-cream, cupcakes…etc. Materials needed: old magazine, scissor, glue and lots of creativity. Method: Cut the pictures of all things that kids love from an old magazine and paste it on the wall in an artistic manner. Your inexpensive wall art is ready. It was a cool activity with learning. 2. Every day diary writing: Creativity is a great quality which promotes emotional, cognitive and mental development in kids. Writing, drawing, painting, crafting are good choices for exploring creativity and imagination power in kids. Writing is a great skill that helps in proper intellectual development. It was a weekend afternoon and we want to do something new and creative. So we had started a new project. Project name: Everyday diary. It is a simple craft which helps kids to develop writing skills at an early age. 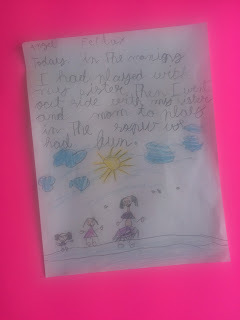 Theme and basic idea: Firstly I had explained to them the importance of writing an everyday diary. We have some special (or not so special) moments every day. You need to write it down on a paper with a drawing and parents can punch this in a diary. Material needed: Plain drawing sheet of any colour, we had taken red one. – Yarn or punching material. Method: Cut the sheet in required size with the help of scissor. -Write down everyday experience on a sheet of paper. -Decorate the cover of diary with drawing. You may use decorative material (lace, stones etc.) for that purpose. 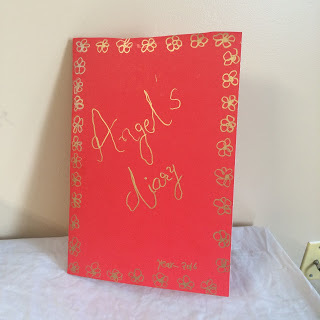 -Everyday diary a super easy craft is ready. These are my little steps to encourage the mental development of children. What activities do you conduct to promote intellectual development in kids? Would love to know from you!